Really I do, and at this time of year as their leaves are turning different shades of red, I can't help but think they are not as bad as many arborists make them out to be. Sure I've been known to role my eyes at thought of planting another 'October Glory,' but in October I wish I had one in my yard. Red maples in the landscape get a bad wrap. They are produced in the millions by growers, and by the time they make it to retail there are layers of pot bound induced girdling roots, and the root flare is almost hopelessly buried. Lack of young tree pruning and disregard for proper crown structure leave them prone to co-dominate stems, included bark, and branch breakage. But aren't these true of many species by the time they make it in the landscape, and maybe we just notice it more on red maples because there is just that many more of them? 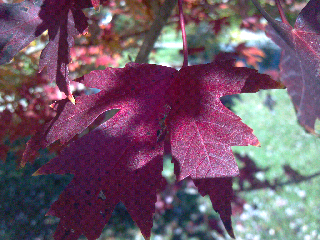 Red maples as a species are incredibly versatile. Native red maples grow through out the Eastern U.S. from low land swamps to rocky hillsides. They are like a native super tree. This species is planted in the landscape from Florida to British Columbia. Except for gloomy scale in the South East there are no more pest problems with red maple then with any other landscape tree. And even in the South it isn't uncommon to see a red maple planted to deep in a parking lot, with girdling roots, and covered in gloomy scale, and though not looking good, still surviving. So take a break from hating on red maples and enjoy some fall color.